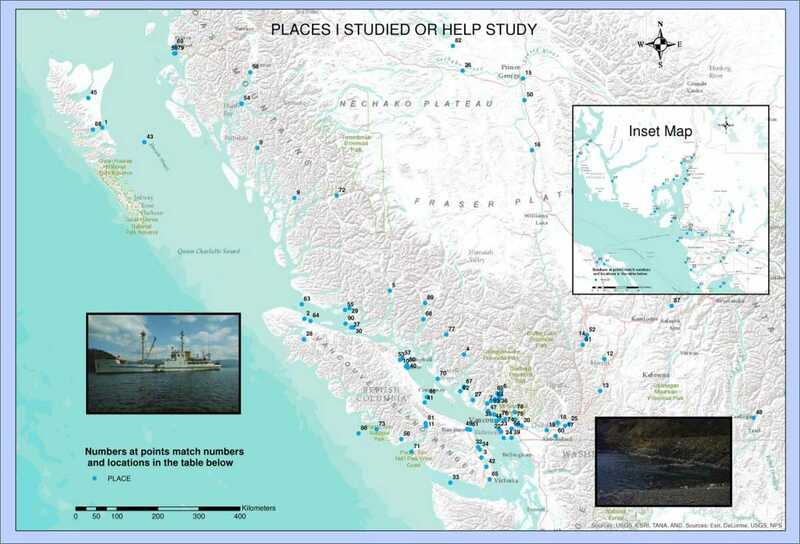 I have worked on fish habitat at close to 100 different places in British Columbia during my career, most of them on the coast but also quite a few in the Fraser River system. Some of them I visited only once and others many times. Some locations I visited on one occasion only because in my job as an applied scientist I was sometimes asked to check out a specific location to give an opinion on fish habitat damage. Places like Crabapple Creek estuary on Haida Gwaii, where there was a chronic oil leakage issue would be an example where I made only qualitative observations on a single trip. Bonsall Creek estuary on Vancouver Island was an example of an estuary I visited only twice and also conducted a short quantitative study at the area. The first visit was a reconnaissance trip to view the extent of the problem – in this case an excessive sedimentation issue. The second visit was an intensive benthic sampling blitz over a few hours –using a Coast Guard hovercraft from YVR following a bumpy trip across the Strait of Georgia. Other locations were areas of intensive multi year research on other specific fish habitat issues. Examples include work at the Nicola-Coldwater River system looking at juvenile salmonid off channel habitat in winter, Campbell River estuary studies examining the role of the estuary in Chinook juvenile to adult survival, work in the Broughton Archipelago looking at aquaculture-environment interactions, and studies evaluating the restoration of marsh habitat in the Fraser River estuary. In all the studies I was very grateful for the time spent with colleagues working with me. It would have been impossible to conduct the work without their guidance and assistance in some very tough field situations. The map below shows the location of the various places where I have worked. Also given below is a link to a downloadable PDF file that contains a table which links the numbers on the map with a place name and its latitude and longitude. To view a place in Google map paste the coordinates into the search function in itouchmap or a similar app. I am very grateful to Brad Mason for developing the map.